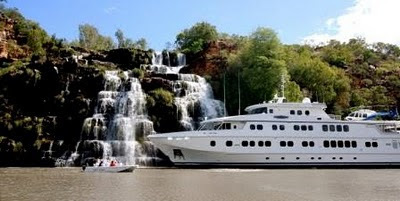 The famed Kimberley Waterfall Season is just around the corner – and the luxury adventure cruise ship, True North, is giving guests the opportunity to experience the Kimberley at its very best! The True North kicks off the 2010 Kimberley Wilderness Season next month. North Star Cruises' General Manager Peter Trembath said the period immediately following the monsoons presented as the best opportunity to see iconic waterfalls such as Mitchell Falls and King George Falls at their thundering best. "In fact, there's no better time to see the Kimberley," said Mr Trembath. "The whole region is transformed by rivers in flood, towering waterfalls and an abundance of wildlife," he said. "Billabongs are swollen, massive wetlands are alive with birdlife, and let's not forget the barramundi will be biting!" "True North's guests enjoy unique experiences you just can't find anywhere else, including helicopter flights to secluded locations every day of the cruise." "This is always one of the most popular times of the year and the remaining cabins won't last long." Helicopter and light aircraft transfers (via Broome) are included in the one week itinerary. The first cruise of the season departs on March 13.